Employees of Colorado King Soopers and City Market stores begin voting today on their first strike authorization since 1996. That means around 12,000 unionized butchers, cashiers and shelf-stockers might soon walk off the job. An authorization vote doesn’t mean a strike would start right away. The vote gives workers leverage in ongoing negotiations with the grocery chain, said Evan Yeats, spokesman for the United Food and Commercial Workers Local 7. The union, which represents about half of all King Soopers and City Market employees in Colorado, is pushing for raises, increased health care benefits and the creation of more full-time jobs. Negotiations between representatives of the two sides have dragged on since mid-December. In a separate statement, Dennis Gibson, president of King Soopers and City Market, encouraged employees voting on Thursday and Friday to consider the company’s current offer, which Gibson says includes some wage increases, job openings and retirement benefits. In preparation for the the potential strike, the company has started hiring temporary workers. A sign posted at a King Soopers in Fort Collins advertised positions for the meat and deli departments as well as the in-store Starbucks kiosk. 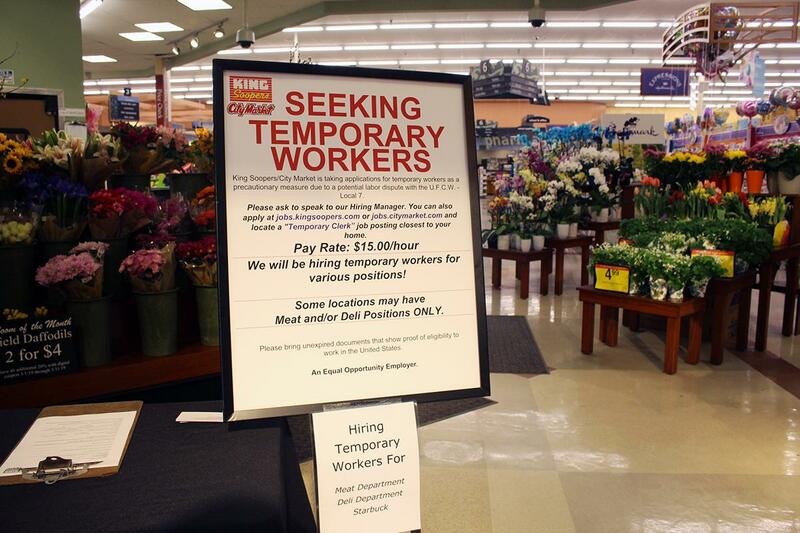 A sign inside a King Soopers store in Fort Collins seeking temporary workers. “Once negotiations stopped we made preparations to ensure our stores can continue to serve our communities,” the company said. King Soopers operates 159 stores in Colorado and is headquartered in Denver. Grocery-giant Kroger bought the chain in 1983. Members of UCFW Local 7 will cast their votes in a series of meetings taking place Thursday and Friday in Denver. Doug Irwin, a meat cutter at King Soopers in Greeley, has worked for King Soopers for more than two decades and makes $20.40 an hour. He said he plans to vote to authorize a strike because he isn’t happy with the opportunities for raises. Irwin said he works another part-time job moving furniture to pay for his family’s expenses. Irwin said the decision to vote for a strike isn’t an easy one.